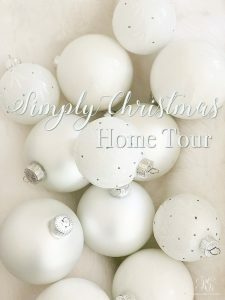 Welcome to our Simply Christmas Home Tour!!! 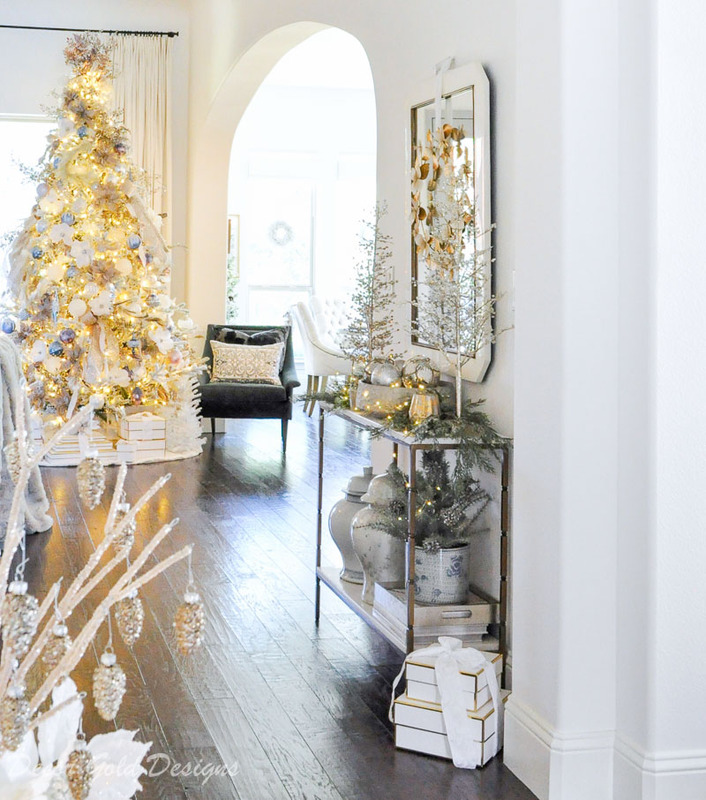 My home is completely decorated for the holidays and I finally get to share it with you! I actually wish I could have a huge holiday party and celebrate this time of year with each of you in person. 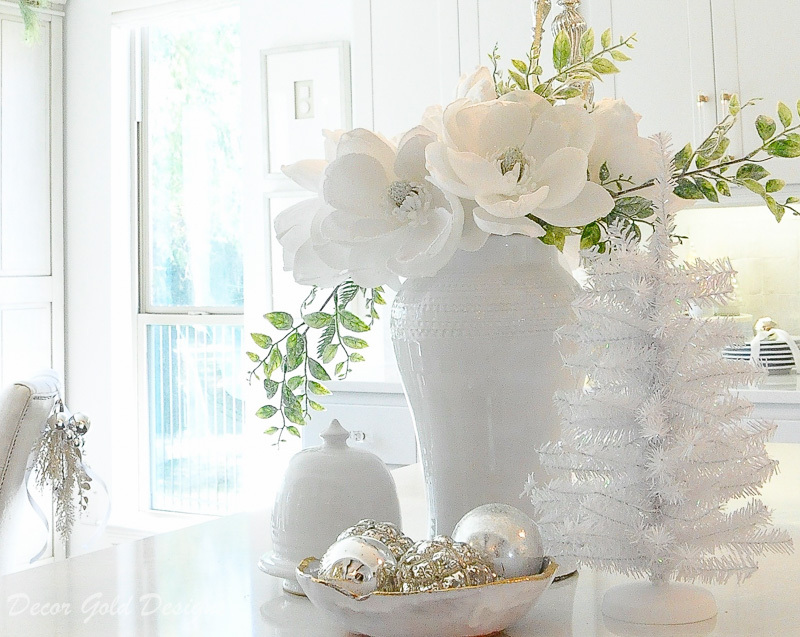 I love the holiday months, but I especially love December! 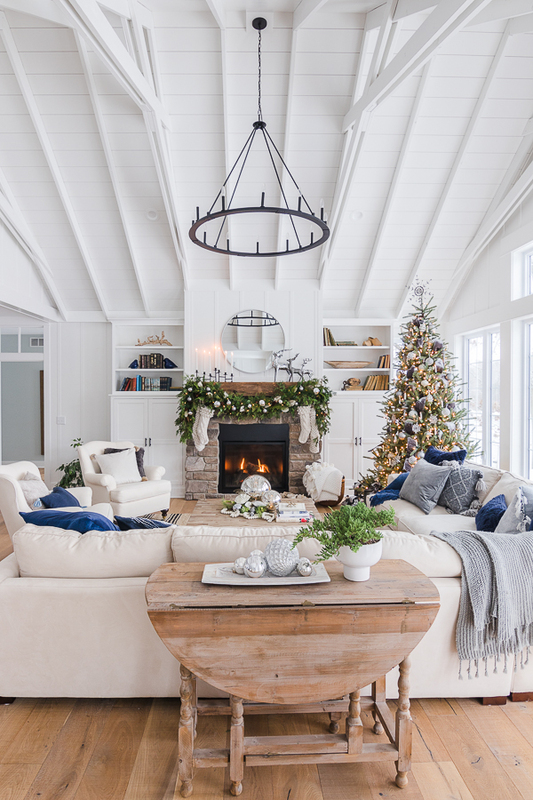 The twinkle lights, toasty fires, hot chocolate, Christmas movies that we’ve seen a million time, and visits from sweet family members are all favorites. 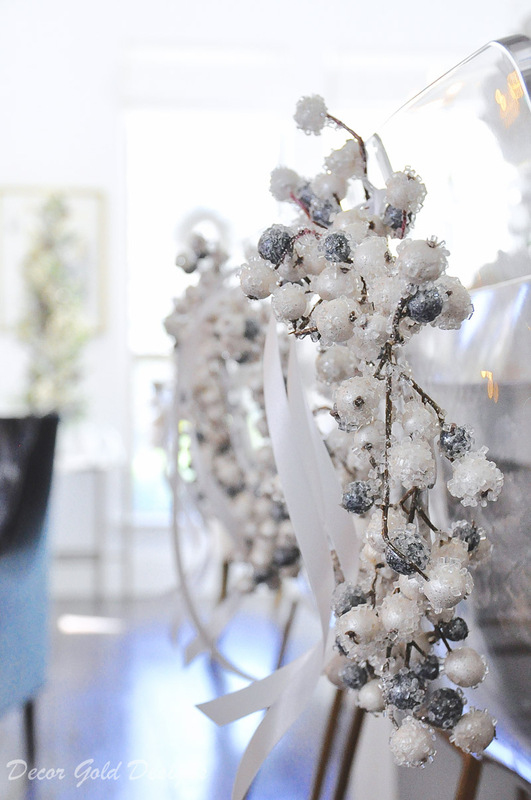 While decorating, I’ve already experienced all of the above, which makes my heart so very happy. 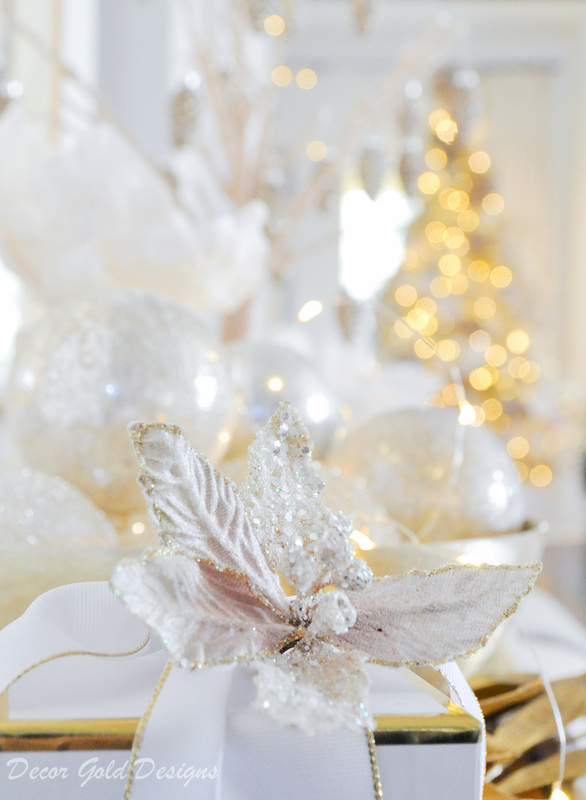 What do you love about December? 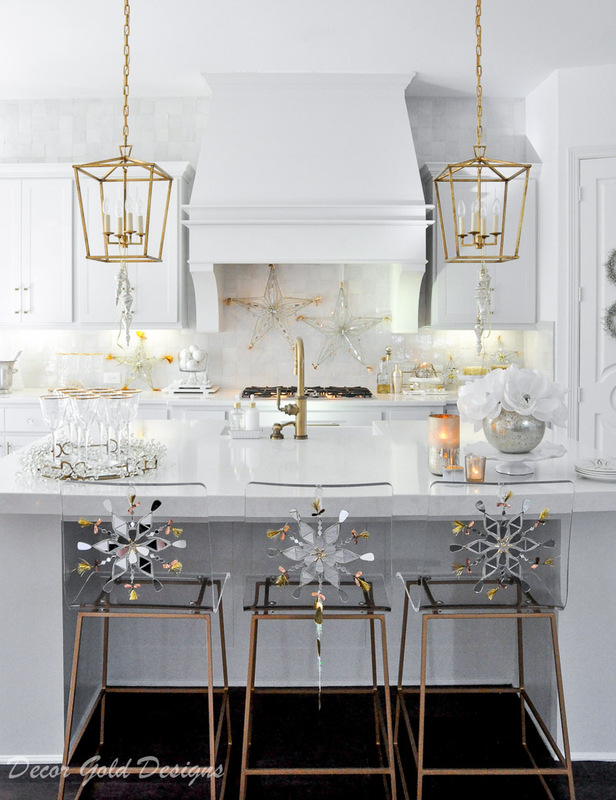 Do you decorate in the same way each year or do you look for ways to change things up? 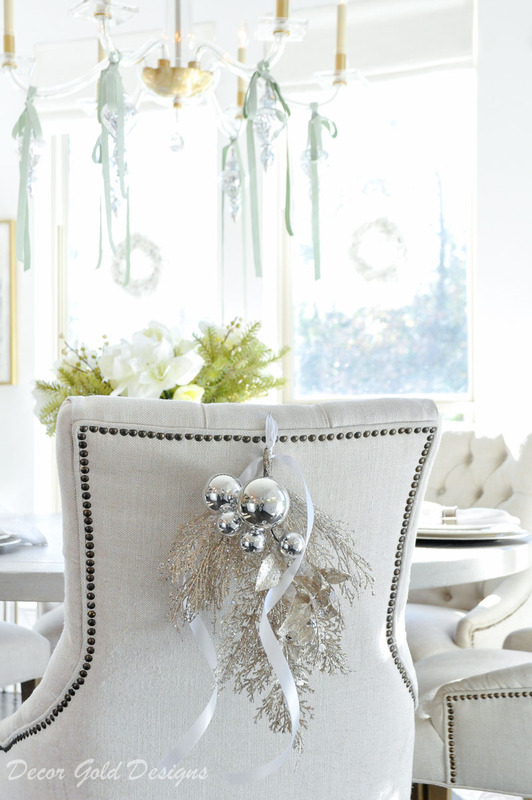 I like to style things differently each year. If you are like me, you’ve come to the right place! 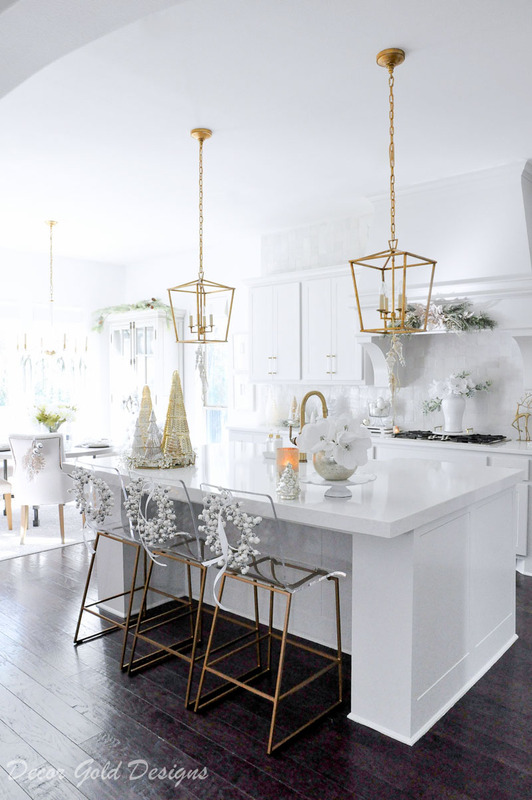 You will find new styling ideas here as well as from five other blogger friends who I’ll be joining. 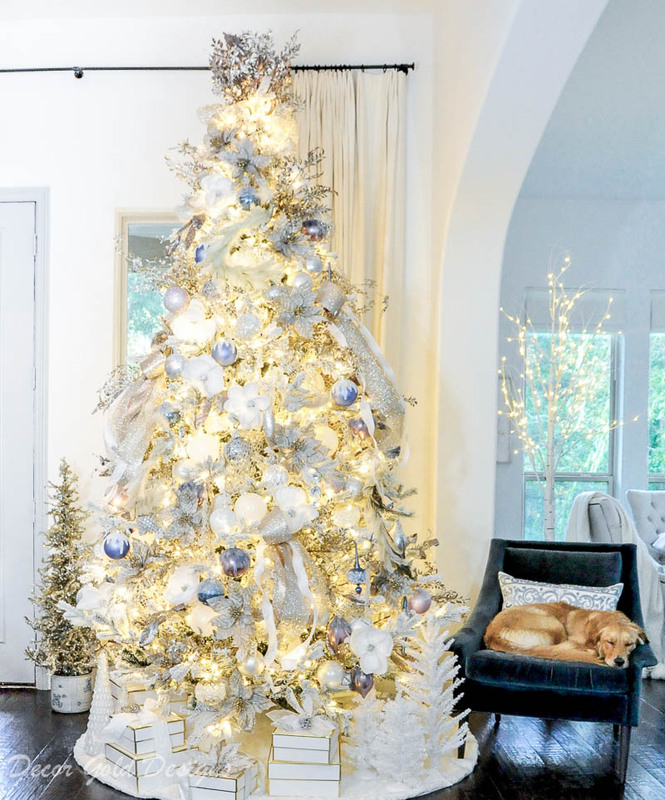 So, be sure to make it the whole way through my holiday home as each of these bloggers have magazine-worthy homes! If you have arrived here from My Texas House, I am thrilled you chose to stop by! 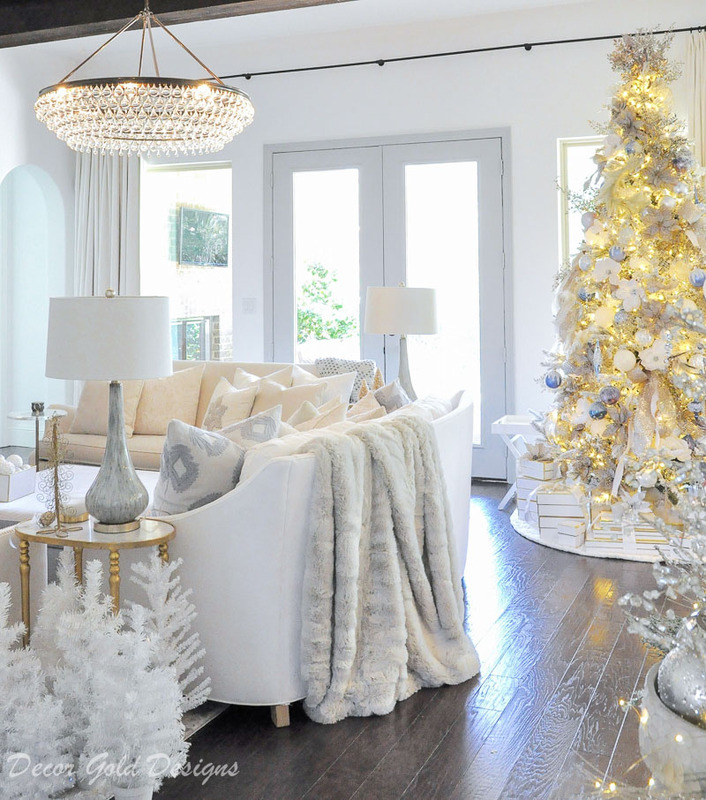 Erin has such a beautiful home, especially during the holidays! Since last Christmas, so much has changed here in my home. 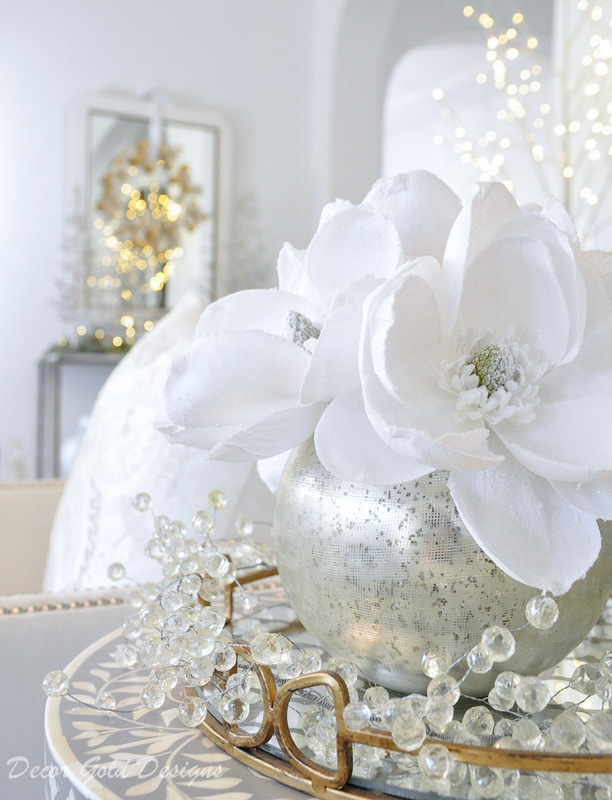 I hope you love our brighter, more transitional aesthetic as much as we do. 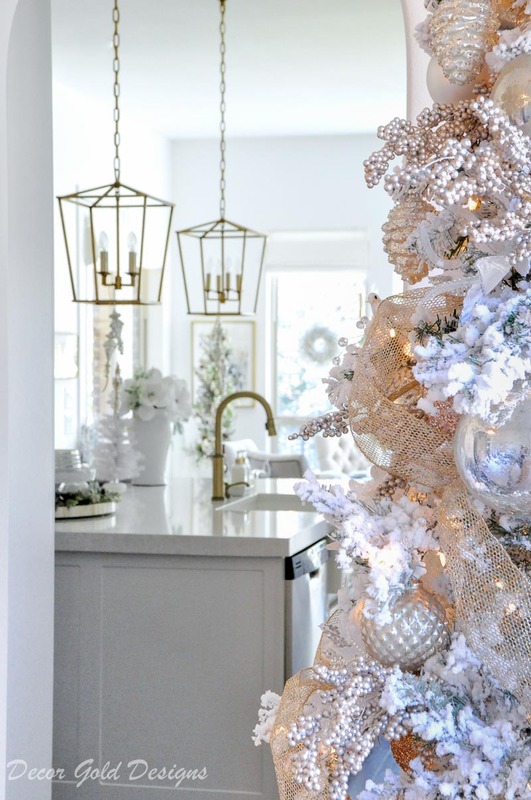 You can find each of our room remodels and updates here and see how I used our holiday decorations to compliment our updated home. *This post contains affiliate links. Disclosure here. 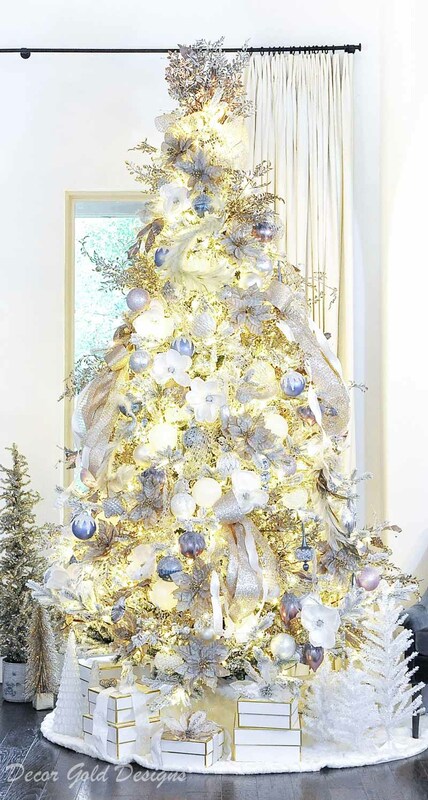 Our new Christmas tree is the first thing you see as you enter our home. For this visible spot, I went all out. 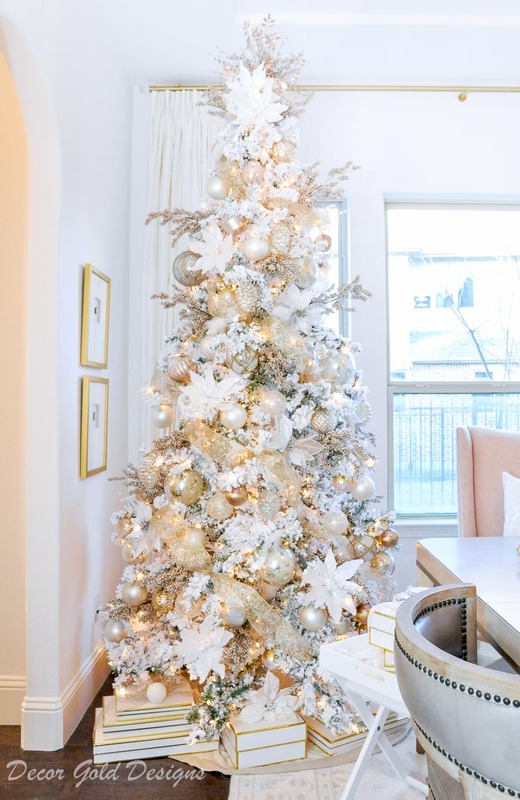 My tree details include a unique color combination, faux magnolias, poinsettias, and sprays. 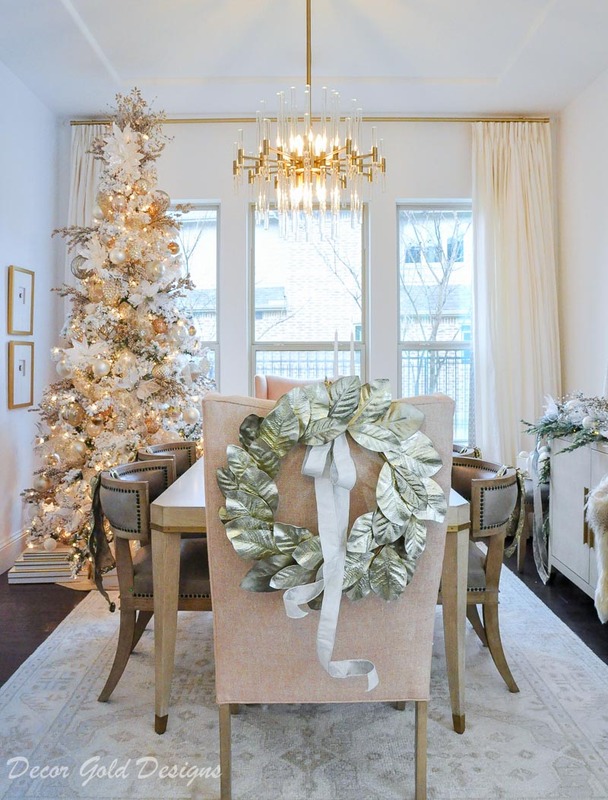 The art and bench dressed in Christmas accessories combine for a golden glam moment. Our sweet Ava still loves her spot. 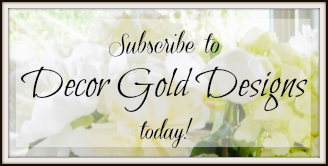 If you are a regular reader, first, thank you so much for supporting my blog! I can’t thank you enough! Second, you may have noticed our living room has changed slightly. For one thing, we wanted a larger ottoman and actually ordered one, but it was defective, so we will be starting over. 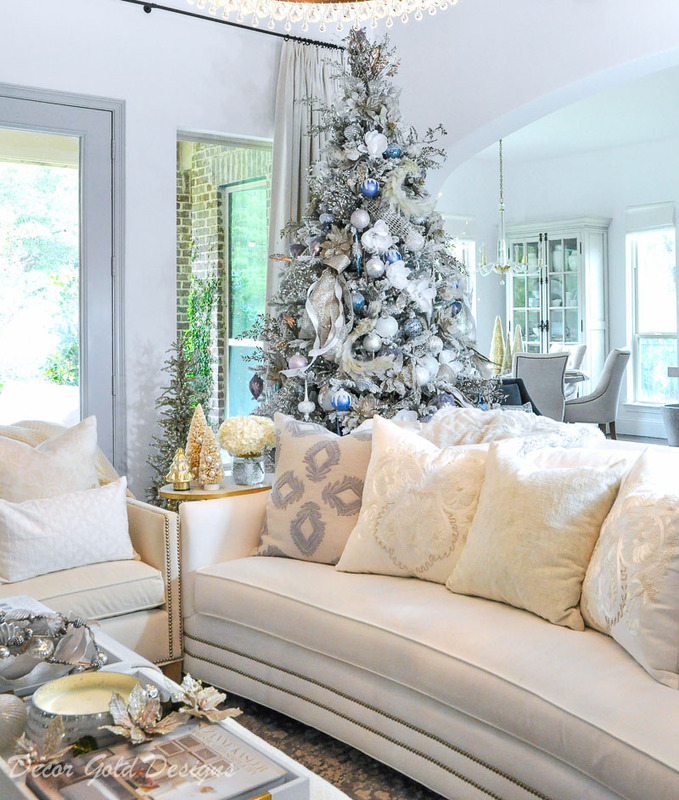 I still sprinkled Christmas around, I just didn’t have a proper sized ottoman to style. Stay tuned! 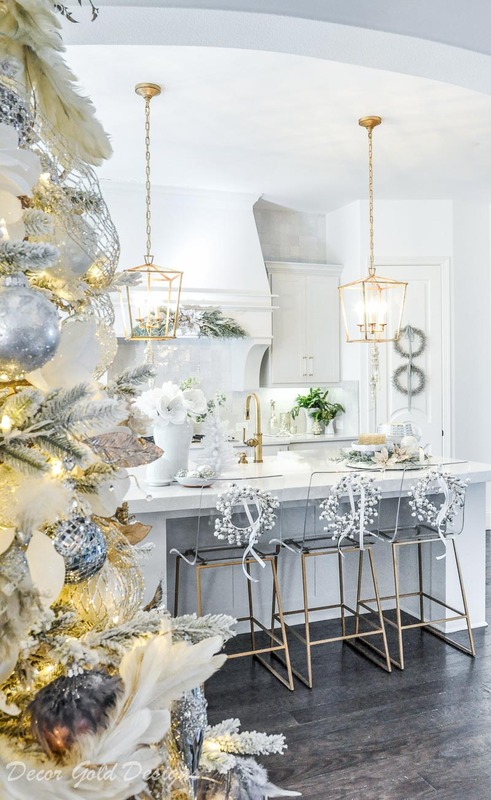 Our new kitchen looks completely different than from my 2017 Holiday Tour. 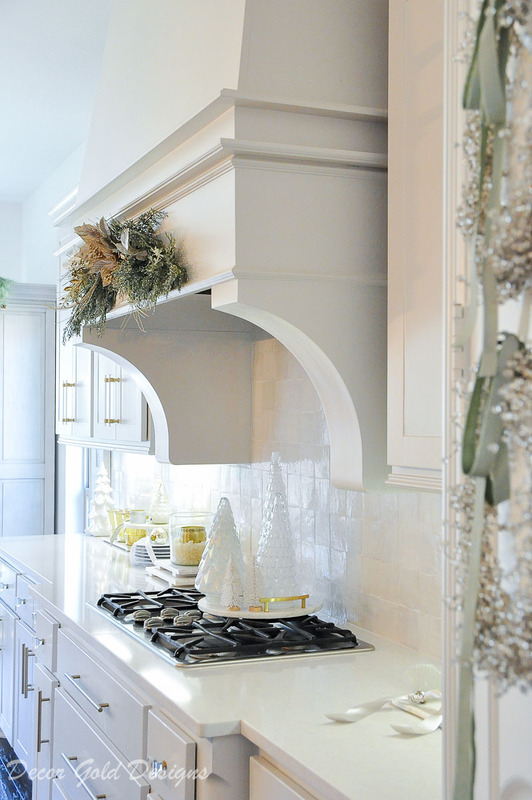 I love the newly painted, bright cabinets and gold accents. 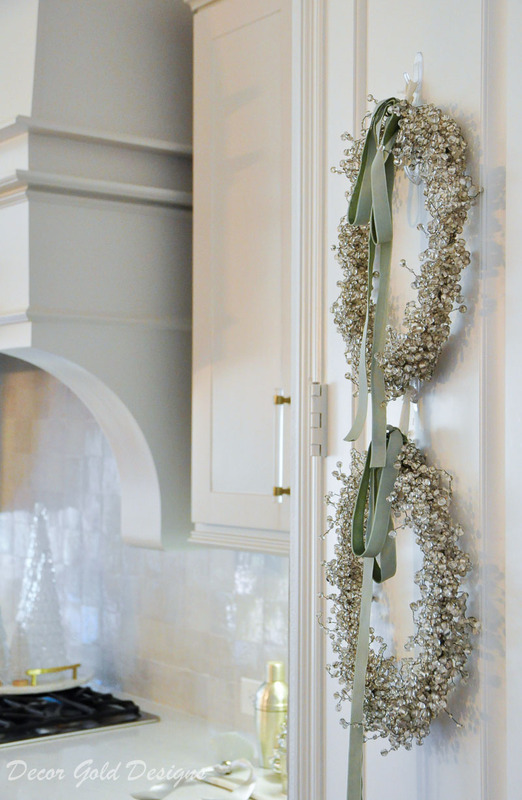 With gold touches built in, I simply added white, silver, and a soft green in this space. 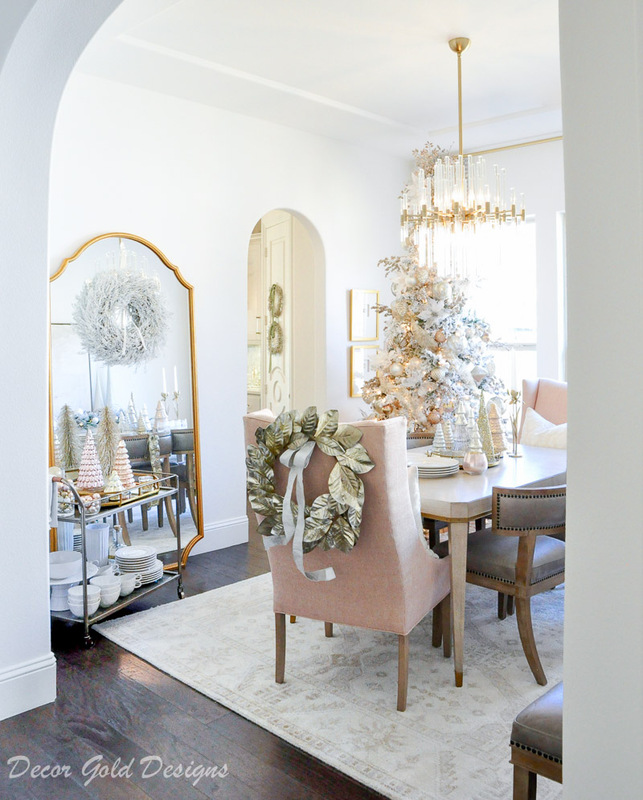 My recently made over dining room was especially fun to decorate this year. 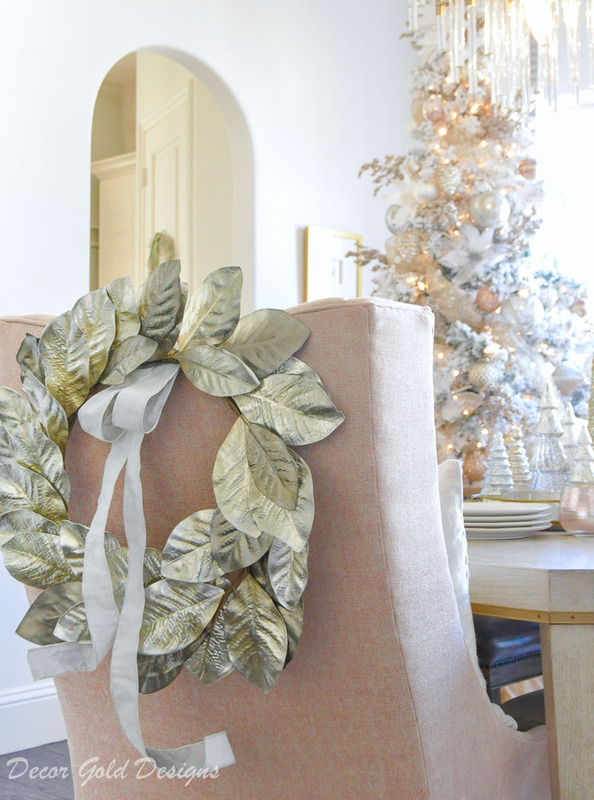 With an over sized wreath and a slender tree, my soft colors and metallics were the stars! I have had a tree in here for several years. 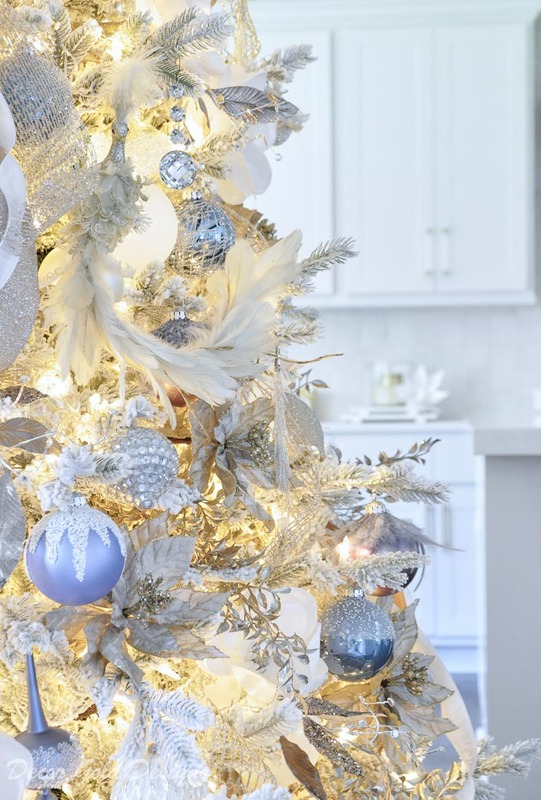 This year, I posted step by step tree decorating instructions. 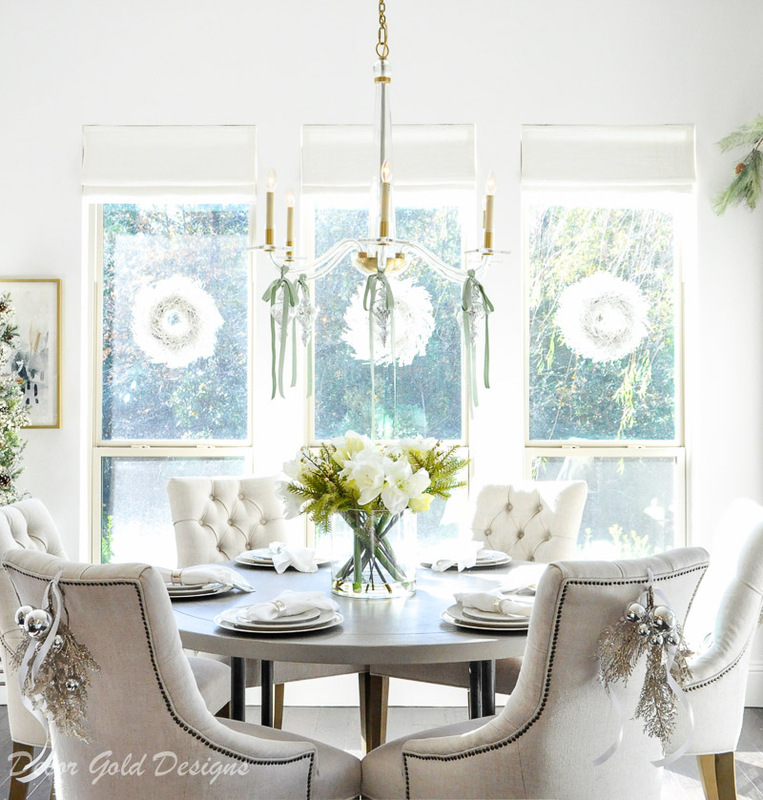 You can also find a full tour of my Christmas Dining Room here. I hope you’ll stay connected…..
Kelly’s home far too amazing to miss. 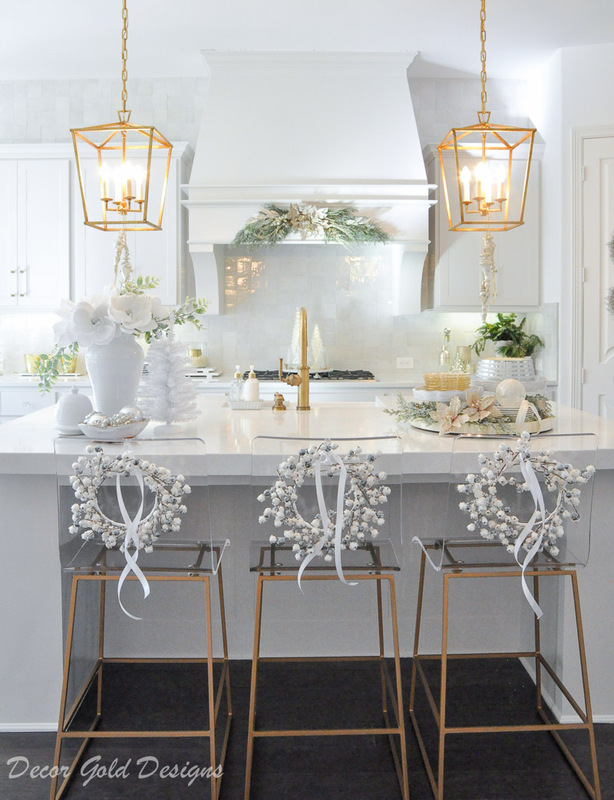 You are going to love seeing her home styled for the holidays…. 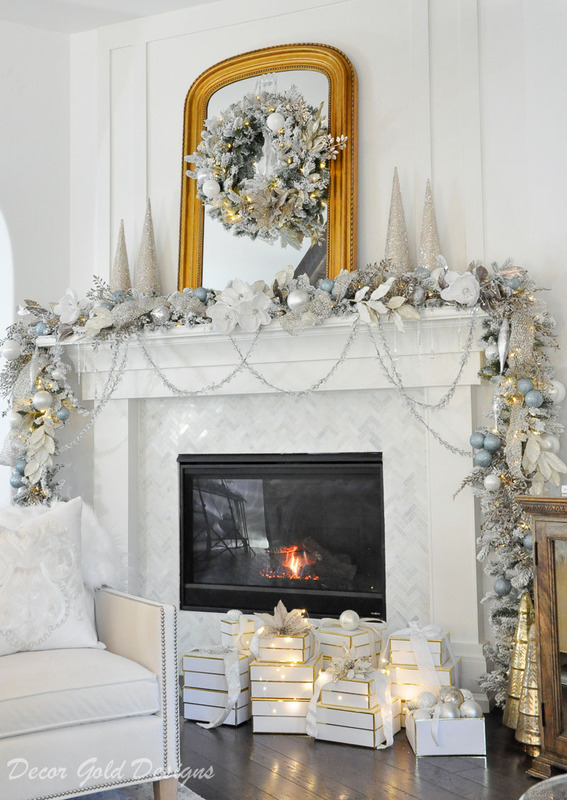 wait till you see her mantel! 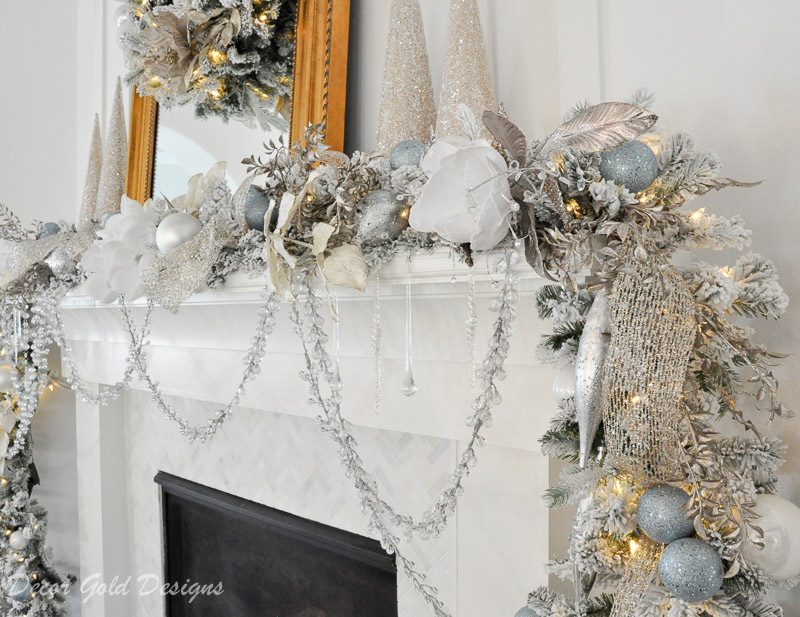 Be sure to stop by Lilypad Cottage first and then visit the remaining bloggers. Follow me on the LIKEtoKNOW.it app! 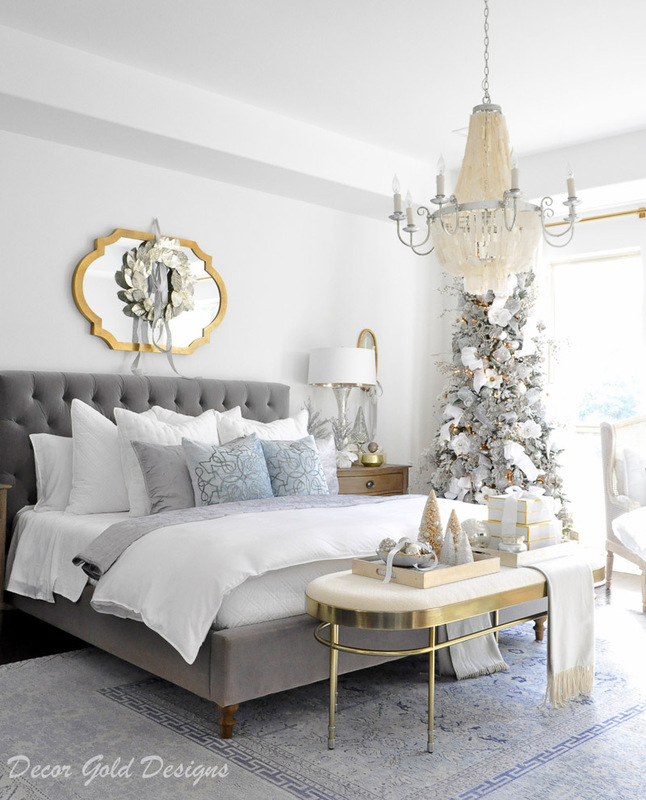 So this legit happened…I scrolled through, awestruck as usual, then I proceeded to call a few of my co-workers over to my desk; and there we were staring in absolute amazement, and dissecting every gorgeous detail of every room. 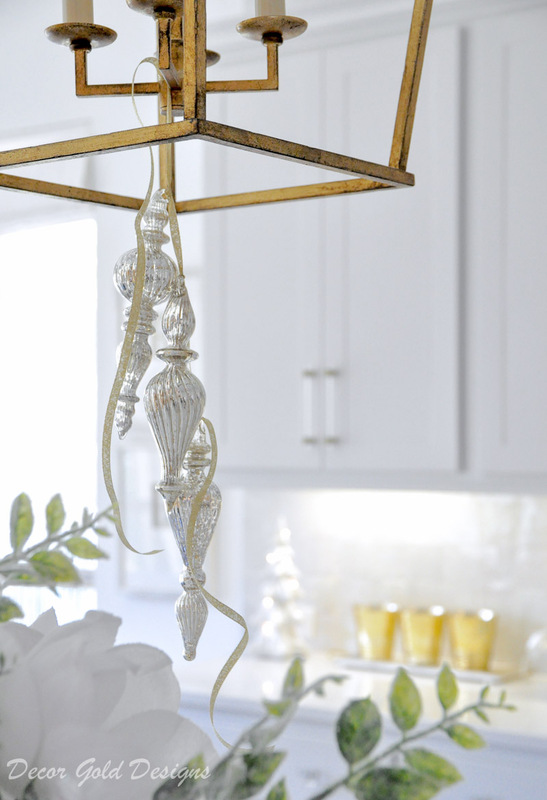 I then declared…and SHE (meaning you ma’dear), ladies, is my decor soulmate. 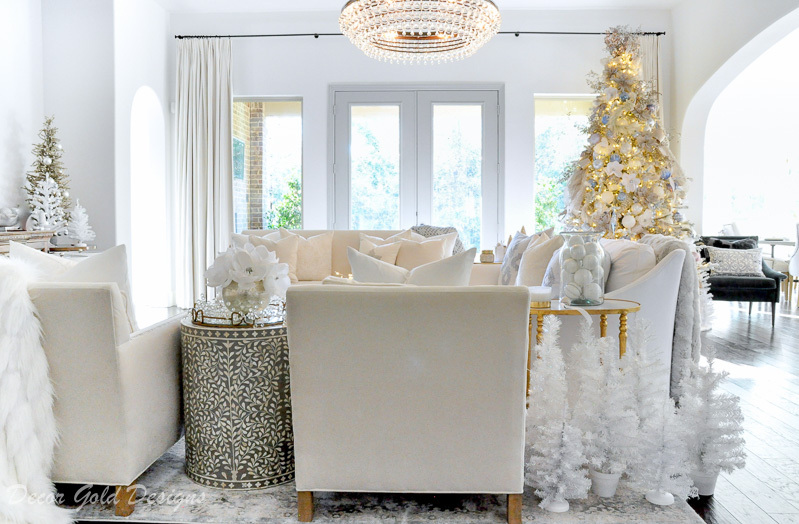 What a dazzling holiday house tour! Elegance at its finest. Everything- and I mean everything-is beautiful. Best wishes for a memorable and relaxing Christmas, Jen. Gorgeous! I love everything! 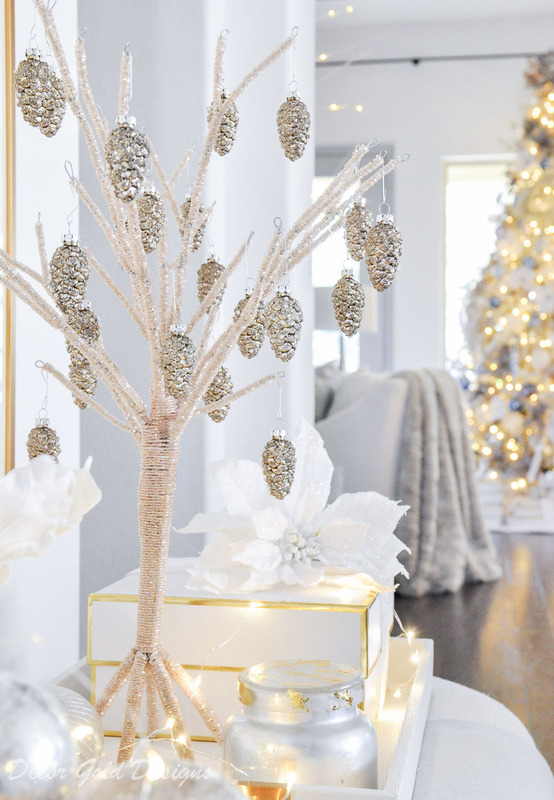 Where did you purchase the mini white trees?